Lawn Mower is one of those games that has many different versions out there. Today I played one by Christopher D. Orr created back in 1987. The game is as you might guess a very simple arcade like game. You push your lawn mower around the lawn in order to cut all the grass. There are a few hazards such as a gopher that can make holes in the ground, and a dog that chases you. If you hit something enough and it hasn’t killed you right away, you damage your mower and require a new set of blades. This requires you to return to the shed to put the new blades on. The game doesn’t really have graphics to speak of as this is a text-mode based game. This means that it should support even the oldest CGA adapter and possibly even MDA. The display is reasonably easy to understand and instructions are provided along with a legend of what everything is. Sound comes only on PC speaker, which is unsurprising as it was written before sound cards became popular. Unfortunately the sound of the mower engine is annoying, much like real life. So it is best to play with the sound off. The controls are easy to get to grips with as you basically use the arrow keys to control your direction. You can change the speed of the mower by pressing one of the number keys across the top of the keyboard. This means you can adjust the speed to suite how fast you can play and the area in which you are mowing. It is wise to go slower amongst the mazes and tighter areas, and faster in more open spaces. One with a hedge maze! The game play has been compared to other games such as Pac-Man, but I don’t know that’s very accurate. There are only really two enemies to avoid in the gopher and dog. The gopher will simply randomly appear and occasionally leave behind a gopher hole that will damage your mower. The dog persistently chases you around the lawn and runs pretty much directly at you mindlessly. Whilst these can both require some effort to avoid the main challenge that will have you replacing your mower is the tighter sections of the lawn where you run into things more frequently. Lawn mower is simple and easy to play for a short burst. It’s fun, but not something you’ll spend hours upon hours playing. I still found it compelling enough to play it all the way through a few times, which didn’t take long at all. It’s good as a quick distraction, and seemingly should run on pretty much any PC including vintage ones. Clyde’s Revenge was made by Moonlite software back in 1995 and is a sequel to the original Clyde’s adventure. Moonlite software also made Hocus Pocus and Taking Care of Business. Clyde’s Revenge appears to be the last game Moonlite software made. It is a puzzle platform game much like its predecessor and appears to use an enhanced version of the Hocus Pocus game engine. When you first start the game you get a nicely animated ASCII style menu that allows you to change the sound card settings and create a profile for yourself. This is unusual as this is usually done in either a separate program or within the graphical menu in game. It does make resuming a game from the level you are up to a little easier as it auto saves your progress in your profile. The graphics are much the same in style as the original, but have the parallax scrolling background capability from Hocus Pocus. The art style echoes the older games improving some elements with extra animations and colour. Each level has a colour theme which changes every two levels. Because there are no enemies in game many elements of the levels are animated including energy pickups and hazards such as lava. In fact in some levels a large number of the static bricks are all animated. This means the game uses more processing power than Hocus Pocus because of how much is animating on screen. There is a wide variety of sound support, more than most games. I used Sound Blaster digitised sound for sound effects and music and found both were quite good. The music changes along with the visual theme of the level you’re playing and reflects the nature of the game. The sound effects are kinda cartoonish in a way, mostly being ok. The sound effect for when you get hurt is however a big annoying scream which doesn’t seem to fit all that well. The game is primarily a puzzle game so game play is significantly different. You are tasked with collecting all the stones that are around a level. This requires you to explore and find all the different areas of the level which are sometimes hidden quite well. There are a few different mechanics that help you travel around levels. Firstly there are the normal controls, which are pretty much like other platform games and are precise. Switches may open up new areas not necessarily on screen and sometimes walking somewhere will trigger a passage to open. Springs will throw you up in the air higher each time you bounce on them. An interesting an different feature comes from the original Clyde game. Clyde has a wand which he can use to temporarily destroy some types of bricks below him. Sometimes this reveals a spring or switch which can further exploration attempts. The game is difficult but easier than the original as the original took energy away just for moving. You only lose energy in this one by falling a long distance or being hurt. Even though there are no enemies, there are still plenty of ways to be killed in a level. It will usually take several attempts to complete a level. There are a few different difficulty levels which may make your life easier (or harder) including one for kids which has infinite health. So anyone will find a setting to suite them. Because it can take quite a few tries to pass a level I’m not all that far into the game. You have to practice a level just in order to finish it, where as in a game like Hocus Pocus you replay a level to get higher scores. This can make it a little repetitive until you are able to move on to the next level, but rewarding when you do. The platforming and puzzles are enjoyable, and like the other Moonlite software games I have enjoyed playing it immensely. Commander Keen is an iconic platform game for DOS, originally released in 1990 by iD software and published through Apogee. It is credited as the first platform game to feature smooth scrolling and animation like that on the popular consoles of the time. It was thought before hand that the PC was not capable of animating things quickly, seemingly a legacy of the capabilities of older PCs. I find it interesting that it took so long before anyone thought it was possible on the PCs of the time. EGA had been introduced in 1984 and VGA in 1987, so the technology graphically had existed for quite a while before hand. Processing power had similarly increased with the 286 and 386 processors. We had our VGA capable 386sx 20Mhz close to the start of 1990 and it was more than capable of playing the fast action platformers that came out, perhaps with the exception of the later ones (such as Jazz Jackrabbit). The machines had clearly been capable for quite some time. In any case Commander Keen was a big change in PC games because no-one had really made games of its kind before. Today I played Commander Keen 4 (known as the first episode of Goodbye Galaxy). I had not played any of the Keen games previously so this was a new experience for me. The graphics in game are a great example of EGA graphics at its best. It’s a bit odd they didn’t use VGA for the graphics, but the artwork for the game does not suffer for it. Everything is beautifully colourful and well animated. Keen himself is coloured well and doesn’t look like he’s sunburned like many characters do when drawn in EGA. Enemies and backgrounds are easy to look at and identify. Being one of the later Commander Keen games everything has clearly been refined quite well. Sound and music is the another big highlight of the game. The Adlib music is some of the best I’ve heard, and I’ve found myself humming the tunes later as I worked on other projects. Sound effects are available through PC speaker or Adlib, I used the Adlib effects and found they were quite good and added to the general charm of the game. The game controls are very precise and platforming is not so much easy, but does what you expect it to. There is the pogo stick which is an interesting addition and allows you to jump much higher, but with less control so it doesn’t feel over done. The difficulty is reasonable yet not frustrating. I found it was quite fun, and I could make progress easily enough. 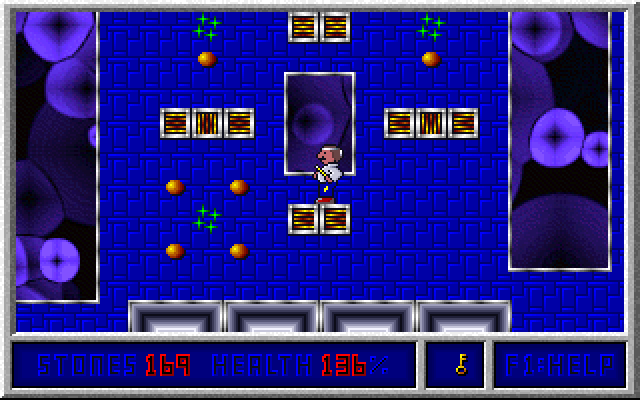 Commander Keen is basically one of the best classic platform games for the PC. The game is great for children as there is basically no violence (ironic considering iD’s later titles) and it is stupidly fun. It is available for download on steam and on iD softwares website, and for the cost I’d certainly recommend it if you don’t already have it.